series 20-Sword Pinstriping Brushes by the Andrew Mack Brush Company. This Pinstriping and Touch-up brush is used by all leading Body Shops for Touch-up and full long line pinstriping. 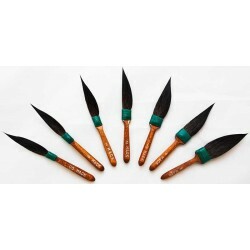 This Sword Pinstriping brushes series 20 is the best for all around work. Execellent for auto body touch-up and pinstriping. Used by pinstripers and sign painters everywhere. European dressed squirrel hair pinstriper brushes with a wooden handle that's lacquer, enamel and water resistant. The series #20 has Dark Green Thread Ferrule and all Hair Lenght out is 2" or 5.08cm, comes in six sizes, available in size 00 (Head Width 7/32"or 5.55mm), size 0 - (Head Width 1/4"or 6.35mm), size 1 (Head Width 5/16"or 7.93mm), size 2 (Head Width 13/32"or 10.31mm), size 3 (Head Width 1/2"or 12.70mm), size 4 (Head Width 1/2"or 14.28mm) and size 5 (Head Width 5/8"or 15.80mm). Individual series 20-Sword Pinstriping Brushes listed below. Sword Pinstriping Brush Cleaning and Care: Always clean out pinstriping brushes well using the proper solvent or thinner for the paint your using. Some cleaning agents that contain more than 5% Methonal can attack the glues for the threads holding the pinstriping brush hairs to the wooden handle, in simple terms, Methonal can ruin the brushes. After a good cleaning, store brushes used in oils or solvent in Brush Oil to keep the hair relaxed and to prevent any paint that is trapped in the hilt/ferrule of the brush from drying. Brush oil can be cleaned out with Mineral Spirits, Turpentine and if need my may use Laquer thinner before using the pinstriping brush the next time. Sword Pinstriper Brush Series 81 Size 0 Buy Mack Brush Series 81 SLS Sword Pinstriping brush - Size 0. This pinstriping brush has a mixture of black .. Sword Pinstriper Brush Series 81 Size 00 Buy Mack Brush Series 81 SLS Sword Pinstriping brush - Size 00. This pinstriper has a mixture of black synthe.. Sword Pinstriper Brush Series 81 Size 1 Buy Mack Brush Series 81 SLS Sword Pinstriper - Size 1. This pinstriping brush has a mixture of black syntheti.. Sword Pinstriping brushes series 20 size 0Buy Sword Pinstriping brushes series 20 size 0 by the Andrew Mack Brush Company. You get 1 pinstriping brush.. Sword Pinstriping brushes series 20 size 00Buy Sword Pinstriping brushes series 20 size 00 by the Andrew Mack Brush Company. You get 1 pinstriping bru.. Sword Pinstriping brushes series 20 size 000Buy Sword Pinstriping brushes series 20 size 000 by the Andrew Mack Brush Company. You get 1 pinstriping b.. Sword Pinstriping brushes series 20 size 1Buy Sword Pinstriping brushes series 20 size 1 by the Andrew Mack Brush Company. You get 1 pinstriping brush.. Sword Pinstriping brushes series 20 size 2Buy Sword Pinstriping brushes series 20 size 2 by the Andrew Mack Brush Company. You get 1 pinstriping brush.. Sword Pinstriping brushes series 20 size 3Buy Sword Pinstriping brushes series 20 size 3 by the Andrew Mack Brush Company. You get 1 pinstriping brush.. Sword Pinstriping brushes series 20 size 4Buy Sword Pinstriping brushes series 20 size 4 by the Andrew Mack Brush Company. You get 1 pinstriping brush.. Sword Pinstriping brushes series 20 size 5Buy Sword Pinstriping brushes series 20 size 5 by the Andrew Mack Brush Company. You get 1 pinstriping brush.. Sword Pinstriping brushes series 20-Assorted Value PackSword Pinstriping brushes series 20-Assorted Value Pack by the Andrew Mack Brush Company. T..